Over almost 50 years of the Gadebrook Stud's existence, horses have passed on and we honour them here. Bay 15.1hh pure Crabbet AHS mare 2005 - 2016. Tragically we lost Pevensey Zariffia as she foaled impressive colt Hadiya in April 2016. The loss is irreplaceable as Zariffia carried the finest Australian pure Crabbet bloodlines, was supremely elegant and had the kindest temperament. She leaves charming chestnut filly Mazaria (2014) by Marbon Masadi and bay colt Hadiya (2016) by Binley Prince Salim as well as a daughter, Pevensey Zaraya and son Pevensey Zayed in Australia. I am eternally grateful to Zariffia's breeder Leon Bennett for allowing his gracious 'Princess of Pevensey' to come to Gadebrook - she will be forever missed. Bay 15.1hh pure Russian AHS Premium mare 1993 - 2014. We are devastated at the loss of dear Pepelka ("Moose" to her friends) at the age of 21 due to increasingly painful arthritis. Gentel Pepelka produced wonderful foals including full sisters by Sambist: Mariska (2013), sold to a Russian breeding programme in the USA and Kallista (2010), sold to Zayin Arabians for racing. We are grateful to her breeder Kerry Wilson and her previous owner Sandra Wilsher, for allowing Pepelka to spend these last years at stud with Gadebrook. I always called Jazmyn 'The Goodwood Horse' as it was the coincidence of seeing her offered for sale in the Thursday edition of Horse and Hound and the fact that I was gigging at Goodwood House on the Friday , a journey that would take me right past The Harwood Arabian Stud . This was fate. I was already thrilled with my yearling colt Czak, who was by the stunning stallion Cezare,(another Harwood horse), full brother to Jazmyn. I had to pop in and see this Crabbet mare. Thank goodness I did! I fell for Jazmyn on sight and am eternally grateful to Monica Calvert (who always followed our progress enthusiastically) for allowing me to purchase her. Jazmyn was three years old when she came to me and she gave me unmitigated pleasure for the next nine years. She was the sweetest tempered mare you could ever wish for and was never capable of giving anything but her best. In dressage she gained over 150 points and placed highly in British Dressage Regional championships, on one occasion she was only one precious place from qualifying for the BD Nationals. Among her many showing wins and supreme championships she won the HOYS qualifier at HOCON in 2002 and subsequently placed in the top six at the prestigious "Horse of the Year Show". I could always rely on her rising to the occasion and the bigger the show the harder she tried. Only giving way to her tendency to 'pogo' with excitement after prize giving, clever girl! In 2004 I took Jazmyn to be covered by BNC Centurionn , a lovely kind-tempered stallion who had proven his ability on the race track himself and through his progeny. 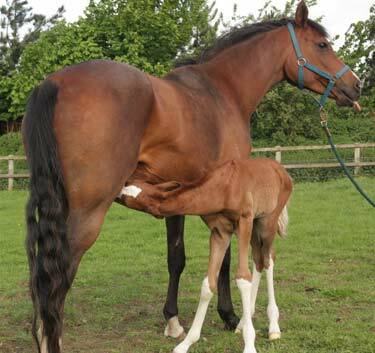 The union proved very successful and Jazmyn gave birth to her first foal the following June, a beautiful filly I named Venus Eclipse as she was born at the time of this iconic eclipse. Venus is now enjoying a very successful career in endurance . 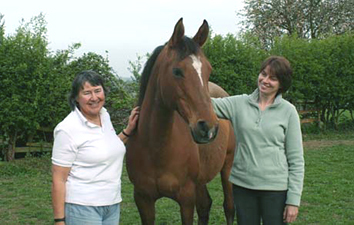 Unfortunately in 2004, Jazmyn developed a ligament problem which made it impossible for her to continue her ridden career so, as she had proven herself to be a wonderful brood mare, Jazmyn became the property of Anne Brown and her cousin Alan Brooks, and she joined the band of Crabbet mares at the highly successful Gadebrook Arabian Stud. Over the last seven years Jazmyn has produced four lovely colts and an enchanting filly, all but one colt by Sambist, proving that her union with the charismatic resident Gadebrook stallion was a match made in heaven . Jazmyn's first foal for Gadebrook, Remynisce, was by the deceased American legendary WAHO champion stallion, Remington Steele. Jazmyn had a fantastic personality and was a loving and loyal friend . I owe her so much and I know Anne, Alan and all at Gadebrook will miss her sorely. Pure Crabbet stallion, one of the best horses ever bred at Gadebrook. Top US Sport Horse Sire + US "Living Legend". Winner of countless Ridden and Dressage titles in Canada and the USA. 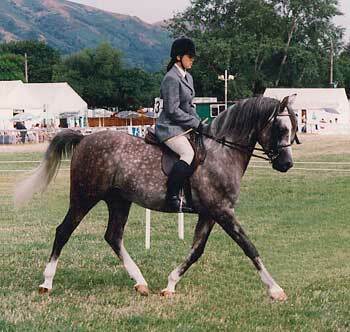 Another great pure Crabbet athlete is lost - the multi-talented Shaded Silver who died in early 2012, aged 24. The handsome grey stallion was bred by Maureen de Popp at her Milla Lauquen Stud in 1988. He was by Golden Silver out of Magics Moonshadow (twin of Magics Moonlight, bred by the Countess of Pembroke in 1977), by Sunlight's Allegro, himself out of one of Crabbet Park's "Heavenly Twins", Dancing Sunlight. Shaded Silver owed his striking good looks to his two lines to Silver Fire, the tail female line going back to Silver Shadow, and his long, comfortable stride to his many lines to Rissalix. His sire, Golden Silver, was one of Silver Blue's most important sons, and out of the in-bred Ludo daughter, Golden Ludo. This created a very successful blend of the "Silver" type with the Blue Domino movement. He was one of the stars from the Moulton Stud of Mr & Mrs DD Wright to appear at the 1985 Crabbet Convention in the ownership of Mr P Everett and Miss J Taylor, who had bought him two years previously. 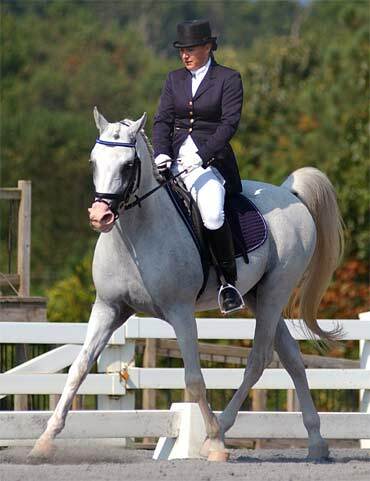 Shaded Silver was a very versatile performer, having competed under BSJA rules, and in hunter trials, dressage, eventer trials and endurance (the old "Silver Series"). Fittingly, he took part in the 2002 Crabbet Convention, as a member of the endurance display team and also representing the Silver Grey group of horses. He won or was placed every time shown in hand or under saddle by his owner, Julie Green. When he was not competing, Julie took him hunting with the local bloodhounds in Norfolk. He bred a string of useful horses, and spent his later stud career on lease to Anne Brown at Gadebrook Stud. He nicked particularly well with Summertime Blues, siring the full sisters Rhapsody in Blue (2005) and Rose of Summer (2006), both now starting in endurance, and with the Ludomino daughter, Zaharina, siring Blue Shadow (now gelded) in 2005 and Azarina in 2007.
saddle, then finally his stud duties. awarded the first World Arab Horse Organisation "Horse of the Year"
Sceptre has left us are greatly treasured. 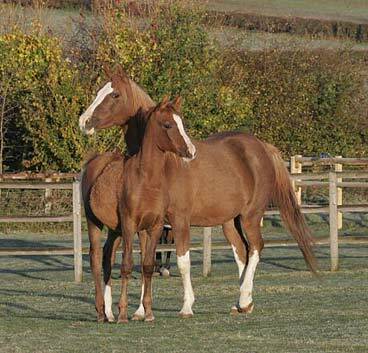 Sadly, both the deep chestnut brood mare Zaharina and Zaha, her bay daughter by Hachim, were lost in the same year, 2010. 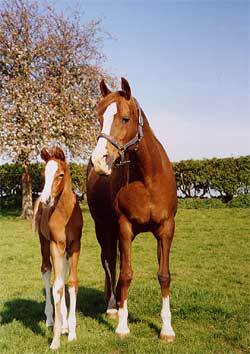 Zaharina, one of three foals born at Gadebrook stud by pure Crabbet Ludomino in 1988, was out of the Zirree el Wada grand-daughter, Zarah, also owned by Gadebrook. One of the other Ludomino foals that year, Magic Domino (out of Hamsfah by Hanif) now pure white, is now one of the most important ridden sires - of any breed! - in the USA. The third foal, Rozina (out of Rosaria by Fari 11) is a great all-rounder under saddle as well as a former Br Nat Champ brood mare. Fortunately, while Zaharina herself was only used for pleasure riding, her foals have been fulfilling their potential under saddle, most notably Zaha (see separate obituary) in the capable hands of Joanne Wallis Baga. 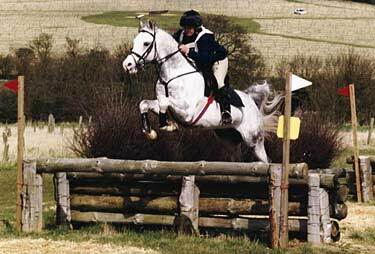 The strong and powerful grey gelding Blue Shadow (2005), by the gifted pure Crabbet jumping and cross country Crabbet stallion Shaded Silver, is embarking on an endurance career as will his tall full sister Azarina (2007), also grey. Another filly from this great foal producer, the bright chestnut Bright Dawn (2006), by International Ridden Champion Bright Cavalier, is retained at Gadebrook but will be available on loan this year to a keen endurance rider. Zaharina was a stylish and easy-moving 14.3hh companion, with a kind temperament but slightly impatient manners who really only appreciated being stabled when she had the responsibility of a foal at foot. Owner and breeder Anne Brown had many offers to buy her over the years, but she was firmly rooted at Gadebrook and was put down at the Northamptonshire stud at the age of 22 after breathing problems became too great an issue. She is sorely missed. She is survived by ¾ brother Zamorin (1992), now white, by Silver Domino x Zarah. Their pedigree is 98.4% Crabbet but 100% Old English of lines that have proven their long-distance worth over the years. Anne has retained Zaharinas 2007 Crabbet daughter Azarina by Shaded Silver, who is now an Advanced Endurance horse.